Unfortunately it often looks as though that shoring up is being done on the backs of the regular working folks via traffic cam tickets that are a hardship on just about everyone trying to make it month to month, crazy new taxicab regulations that are a hardship on many career cab drivers, unwieldy and seemingly serendipitous permitting requirements on club owners who are the small business owner/job creators we hear about every day, more permits on the smallest of entrepreneurial business owners--the vendors at Second Lines, and on the culture bearers themselves—the musicians and artists who create the culture that draws visitors to our City every year from all over the world. Lately we've heard words like noise, crackdown, permit, and ordinance used to intimidate bands off of street corners, to cause clubs to stop live music for fear of total shut downs, and as you know, those words have been a sometimes unspoken threat to parades and Indians for a long time. There have to be other, better ways to pay for the needs of this City, ways that don't threaten an entire cultural fabric with becoming an historic footnote or an artifact in a museum; ways that don't send our club owners into bankruptcy, our musicians into the unemployment lines or worse, into the clubs of Austin. I know several men who grew up here who are about your age. They have entertained me with stories of their youth: jumping out of bed early to try to catch the Bone Men just as they start out, waiting on certain street corners to hear the approach of an Indian gang and being thrilled to catch a glimpse of the Spy Boy in his suit looking up and down the block. One friend has a story of being about 14, riding a Mardi Gras float as what he called a “float grunt.” He wrote the story down and it was published. They've told me lots of stories, some of which I am sure their parents still know nothing of today, but they all involved spontaneity, expectation of a remarkable experience, and above all, music. Whether they were walking down the street hearing it from a corner or a backyard or out the door of a club on their first forbidden walk down Bourbon Street, to a man their eyes still get wide in the telling of the story, the awe they felt seeing this or that now long dead musician is still in their voices, the joy of hearing that one long perfect note still resonates in their memories today. I am betting you have some memories like that. Perhaps you even have some still secret ones, the ones you'll wait to tell your kids until they have kids themselves. That makes you and all the other people who grew up here in New Orleans unique. Your contemporaries in other cities in other states didn't have the wealth of culture, the almost embarrassingly rich culture, that you did. They most certainly didn't have the wide range of music right there, right there in the streets. 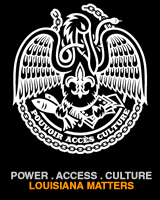 I have been attending the discussion meetings that Kermit Ruffins has so kindly opened his doors for regarding clubs, permits, and all the other issues surrounding live music lately. The attendees are club owners, musicians, visual artists, and music lovers, all wanting to find a solution to the various issues involved. I very much want to thank Scott Hutcheson for joining us and speaking with us. I believe that since he is there on your behalf, that you believe the words on the NOCVB website. There is no doubt that it's a true statement: “...in New Orleans, culture bubbles up from the streets.” Someone at the last meeting made a comment that that culture has come from the most marginalized neighborhoods and population in the City by and large. What they didn't mention was the scope and importance of the street culture within those neighborhoods and the rest of the city. Today, the way the ordinances are written, they could get a ticket for playing or rehearsing in their backyard, or on their stoop, or in their house, or on the street. Mr. Mayor, the way the ordinances are written right now you could get a ticket for playing a tambourine on your front porch, and while I don't know for certain, I am pretty sure there is a tambourine somewhere in your house. It seems to be standard equipment in New Orleans' households in every neighborhood. Finally as I listened, I came across the story I had been looking for. It was told by Kenneth Terry, the trumpet player for Treme Brass Band. He remembered being about 7 years old, standing on his stoop when a parade or second line went by. There was a man playing trumpet with one hand, holding it up in the air like Gabriel himself. Kenneth was mesmerized and told his mom he wanted to do that. Soon she bought him a trumpet from Weirlein's. A few days later there was a knock on the door and when Kenneth opened it, he saw a man standing there. Kenneth said to him, “You're the guy who played with one hand!” The man said, “Yeah, Kenny, your mama said you want to play the trumpet.” That man was Milton Batiste and he took him to his house and taught him and helped him. Mentored him. A legend helping a 7 year old kid just because the young man showed interest. I am pretty sure that nothing like that happens in Dubuque. In that way the culture was handed down to the next generation intact with room for innovation, evolution and growth, but still uniquely New Orleans. Every note played, every bead sewn, every dance step taken has been handed down by those who came before. It's a living, breathing thing, this culture we are lucky enough to experience, and if we legislate it too much or try to make it too orderly we will lose the spontaneity that lets it breathe. If that happens, if it is allowed to happen, this culture we love will die, but only after becoming a caricature of itself. That, sir, would be the world's loss not just ours. Mr. Mayor, someday you'll tell your stories to your grandchildren, maybe even some of the secret ones. I hope that you will be able to tell them the story and then show them what you're talking about. You'll sit on a curb with them in the summer sun, laughing to yourself about the blue snoball juice dripping on their clothes as they dance to the rhythms of an Indian practice taking place inside the door. You'll take them into the Quarter where they'll see other kids their age hoping the bigger guys will let them play a few notes on their horn and maybe one of those grandchildren will ask you for a trumpet. You'll grab your tambourine and take them to dance in a second line letting them choose from the list of Sundays held by a magnet to your refrigerator door. You'll play the music you grew up with for them and look forward to the kind of music their generation will create and hear, still bubbling up out of the streets, just like the Visitor's website said back in your day. You'll do all this with a huge smile on your face, with the quiet knowledge that you played a large part in allowing that culture to live on by nurturing it and not letting it become a parody of itself. Or you'll do it with great sadness, the sadness we feel when we look at an endangered species. Mr. Mayor, this cultural protection can be your most important legacy. Please, sir, take up the fight so that so that this culture, your City's culture, isn't as remote an idea to your grandchildren as a saber toothed tiger. For a long time, my friend LD over at The Truth and Other Lies has been fighting the good fight on the permitting issue, beginning with the absurd exchange he had regarding creating art in his own home. (Seriously, the way the law is written currently you need a permit for that so put down your paint brush and step away from the glue gun. Holster that chisel, you sculptor! You over there, what do you think you're doing with that clay?) He has been through the various ordinances and he's doing a series on his blog about them. Here at New Orleans Slate, I have several guest posters lined up and will post their perspectives as soon as they are submitted. Also of immediate importance: THERE IS ANOTHER MEETING AT KERMIT'S SPEAKEASY TOMORROW, OCTOBER 3 AT NOON. We can't let the pressure drop down on this issue and we have to find a way to work together productively, so let's keep it up. Until my first guest post is ready to publish, why don't you wander over across to LD's and read this latest post. He has a good chronological timeline on all this. (He also mentions the Eris Debacle which I wrote a lot about at the time. For the record, last I heard the Internal Report had still not been a. finished, b. made available, or c. done at all. I talked to someone recently who told me to request it again and I think I will.) His post is a good read so go visit!